I have these shoes. They’re easily my most prized item of clothing. It’s not that they’re worth a lot of money or are from a top designer. Rather, it’s the fact that they represent a beautiful story. I got them the week after Thanksgiving last year. This was a particularly difficult time for me emotionally. I had just informed my now ex-husband that I was filing for divorce three weeks prior, and we spent Thanksgiving dinner together at a Golden Corral because we had no family to visit and no kitchen to eat in. I very vividly remember getting a bowl of macaroni and cheese and a salad and eating maybe two bites before everything tasted like cardboard. That night, a friend and I left to spend the weekend in Dallas. We went to a concert, ate and drank far more than any two people should, and did copious amounts of shopping. The shoes were my big purchase of the trip. About two weeks later, my aunt passed away after an extremely long and difficult battle with multiple sclerosis. 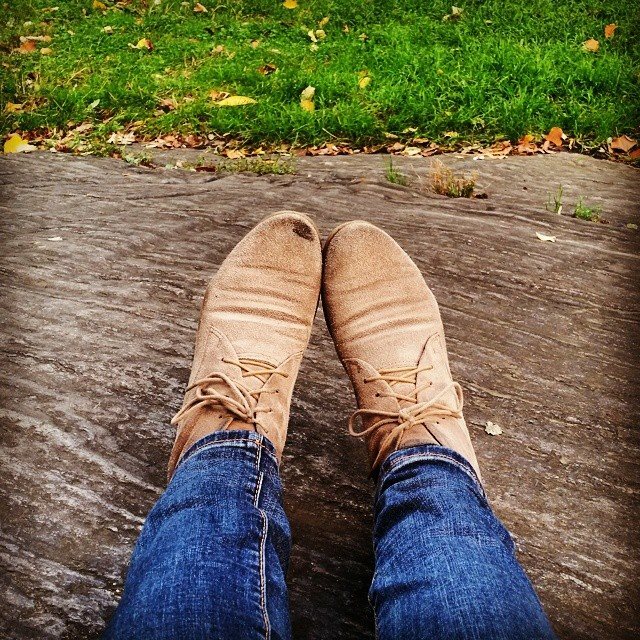 My shoes accompanied me to the gravesite as my family said their final goodbyes. The wind was sharp and cold, and the only part of my body that had any sort of warmth and comfort were my feet. It seems silly to think about that now and write the words down, but when you’re in the midst of difficulties, the strangest thoughts pop into your head, even thoughts about how it’s nice that at least your feet are warm. I spent the next five weeks in Texas with family and friends. There was a four day period where I stayed with some friends and we took a mental vacation with hours upon hours spent playing video games with short breaks only for sleep and food. I would reach down and tie the laces of my shoes so often without looking that they almost seemed to tie themselves. Soon after that, I took the biggest leap out of my comfort zone yet and moved to Frankfurt. The shoes accompanied me through bag checks, security lines, and customs. I wore them for countless walks around the small village of Kelsterbach with an infant that quickly stole my heart. They kept my feet comfortable and warm through rainy days back and forth from the middle of the city picking up the greatest little girl I’ve ever known from preschool every day. They were the only shoes I brought with me when I went to Israel a month later for work with the family I lived with. It was during one of the days wandering through the maze of streets that make up the old city of Jerusalem when the left shoe acquired an inky black mark on the toe. I still have no idea what it is, but I don’t think I really care to know. I walked around the streets of Paris wearing the shoes even though they had started to show a little bit of wear and tear. They accompanied me to Lugano in the south of Switzerland. They were the only shoes I brought when I visited a friend in Aarau, Switzerland, so when I rode on the back of his motorcycle from his flat back to the train station in Basil in the rain for an hour, my shoes were drenched and didn’t end up drying out for two days. When I finally got back to the states, I wore the shoes walking around the city of New York, and they supported me through the hours I spent on my feet at the Warsaw bar in Brooklyn during the Damien Rice show, which is arguably in the top 5 moments of my life thus far. When I was talking to a friend last night about writing this post, I told him that it felt a bit superficial to be writing an entire blog post about a pair of shoes. However, this point in all of this is that these shoes have become a physical symbol of the changes I’ve been through this year. They might be a bit beat up and worn down, but I am absolutely in love with the character that the dirt and water have added. There are stories behind every little mark, and that’s the beauty of it.